Super Late Model and Pro Stock racing is gaining strength throughout the United States. The Snowball Derby and Speedfest in Florida drew a ton of cars this winter, the TD Banknorth 250 at Oxford Plains Speedway (ME) was such a tough nut to crack that this year’s eventual winner Mike Rowe almost didn’t qualify. Regional tours like the IBG-PASS Series in the Northeast and the CRA Super Series in the Midwest are strong. Interest in the BAMA Series events at Montgomery Speedway in Alabama has been high all season long. And the battle to the win was big as well. Two hard luck, but very talented, drivers with solid teams put on a classic show through the 250 green flag circuits. They overcame trouble from all sides and in the end, it was Scott Chubbuck besting Travis Benjamin for the victory. The early part of the race was plagued by trouble. Only green flag laps counted and in the first 93 green lap “official” laps, there were nearly additional 200 laps run under caution. Backmarkers would spin and wreck and then repeat that cycle time and again. A few drivers got hot with each other and one even took matters into his own hands. Cars got crunched and drivers grew inpatient. However, after every restart it was the Chubbuck vs. Benjamin show. Scott Alexander broke through to lead while those two pitted for fuel and tires, but that was short lived. Within 10 laps, Chubbuck was back in the lead. Two laps later, Benjamin was back to second place. Racing each other made the two drivers feel comfortable despite the carnage around them. 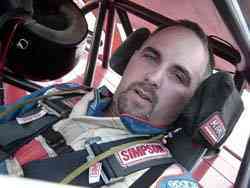 “I’ve raced with Scott for a long time and the #0 [Sean Turple] and #15 [Alexander] a few times now,” said Benjamin. “They are all good. They all run clean and they aren’t out of control. I wanted to run out front with those guys to stay out of trouble. So when trouble did strike the leaders, it was because of lapped cars. 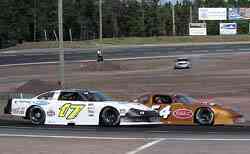 With 43 laps to go, Chubbuck got shoved high in lapped traffic and Benjamin took over the lead. 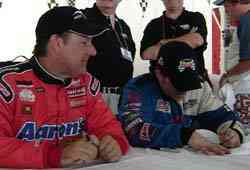 As it turned out, the two hard luck American Pro Stock drivers swept the top two spots. Chubbuck won and Benjamin was appropriately right on his tail. A little bit further back were Canadians Alexander, Turple,[who overcome an incident that left his racecar with front-end damage] and Wayne Smith. Only the top five cars were on the lead lap at the end. Chubbuck, who is usually a quiet guy who lets his driving do the talking, was all smiles after the victory. Johnny Benson and Travis Benjamin sign autographs for fans. None of that seems to compare though to the reception that the low, light and fast racecars get in the Canadian Maritimes. The Irving Oil 250 at New Brunswick International Speedway wasn’t just a race this past weekend. It was an event. There were 400 RVs at the track and what seemed like 7,501 fans in a facility designed to hold 7,500. That didn’t include 39 entries on a weekend when most American entries were diverted to the PASS points race at Canaan Fair Speedway. 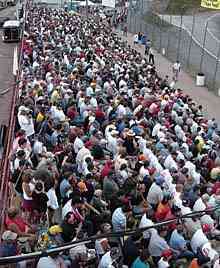 Irving Oil brought 175 guests to their hospitality tent for the race. Peterbilt Trucks brought 400 guest. Big names like NASCAR Craftsman Truck Series driver Johnny Benson and Northeastern racing legend Dave Dion were on the entry list. This was big. Chubbuck wasn’t the only one to lap trouble. Benjamin until there were 30 laps to go when another car laid oil down on the track. Benjamin hit the oil and sailed off turn one backwards into the dirt bank. He needed a tow truck to get out, but with the caution laps not counting, he was still on the lead lap. Amazingly, when the other lead cars pitted he was placed back to second on the restart to resume his battle with Chubbuck. The crowd at NBIS - during the heat races! Benjamin caught up to the rear bumper of Chubbuck’s Cushman Competition #29 a few times but could not challenge for the lead again. “I was in the tires so long and my tires cooled off, so it took 10-15 laps before I was comfortable. We reeled Scott in again, but it was hard to pass him. He’s good enough that I wasn’t going to pass him twice. He was also quick to praise his nearest competitor. Benjamin (#17) passes Dave Dion (#54) before going on to win his heat race. And although Benjamin was hoping for a win, he wasn’t heartbroken at being the runner-up either. preliminary races, hardly any fans left early. In fact, most didn’t even head for the exit as the race ended and the clock marched towards midnight. Instead, most ventured to the pit area to meet the drivers that they just watched. Stock car racing might be America’s favorite spectator sport, but it’s pretty darn big North of the Border as well. Speed51.com will have more from NBIS coming up with a helping of Canadian flavored leftovers soon. The top three in victory lane.